As all you know, games presented to #CPCRetroDev are right now under evaluation by the jury. Awards giving ceremony will be held on next friday, 10th of november, around ~19:00h (CEST time) and will have live streaming. In the meantime, you may have a look at recently published trailers of the 29 games presented. Going by the videos, I think it's obvious who the winner is this year and it's deserved. It's not that obvious to me. Attending to the rules and how the different aspects of the games are going to be evaluated, it's difficult to foresee a winner. There are several games that will be narrowly contending . I shouldn't have looked at the teasers, but I couldn't resist . I think the quality is very good, about half the games have original music and almost all of them seem playable, contrary to the previous year where a lot, lot, lot, were buggy. I see four games that are the main challengers, I was impressed especially impressed by two of them. Well done! I have seen the trailers and its clear that this year is better than all the other 4 years. 4 or 5 games look very profesional and at least another 10 or even 15 look like proper games. I remember last year only there were 10 proper games and 3 or 4 "profesional" with many demos or terrible unfinished games so... im very happy! This contest is getting better and more famous every year so i wish it keeps going up and ap! A great selection of games, a couple look very very polished affairs. Great effort from everyone who has submitted. Wow, this year's entries seem to be collectively of a higher quality! Really looking forward to playing them. "Cris, odd prelude" looks very polished indeed. It has a "Limbo" and perhaps "Another World" vibe to it. Profanation 2 looks absolutely outstanding too. Baba's Palace looks excellent, as does Bitume. Basket cases really reminds me of Hypersports, play that game a lot when on holiday in Devon as a kid, this game looks really good. Yes! i think the same when i saw the game!! What kind of amazing game is this? What is the group that is making this game and why we didn't know nothing??? i'm really astonished with this game, i want this game, and i want 1000 levels of this amazing gameplay on my CPC!! I like Basket Cases, it looks amazing. Really liking Basket Cases (and CNGsoft is awesome, I still play Frogalot from a previous contest). Also Baba's Palace even if I inspired some of the graphic style so I've been told. Apart from the awesome games already covered I really like "Cris, odd prelude" , it seems to have Another World like gameplay. Really cool. Let me introduce myself. My name is Tulo. And I am one of the members of Dreamin'Bits group, "Cris, odd prelude" creators. It was awesome working on this game and it was very hard fitting it into 64KB. We left a lot of things out of the game. But we are not complaining. It was great having the deadline and all the limitations. We are very happy of having participated in CPCRetroDev contest! We are extremely pleased with the reception the game is taking. Those are being amazing days. Thank you! And finally we want to say that this is only the beginning. We are now designing and planning the game to be loaded from disc. This means more graphics, more animations, more puzzles, more maps, more units, conversations and much more. So stay tuned. We will be talking on twitter, updating our webpage and of course posting here! This is an amazing community. One more time, thank you for everything. I've only one thing to say: SHUT UP AND TAKE MY MONEY!! The game looks fantastic Tulo and I can't wait to play it, the animation on main character is superb! 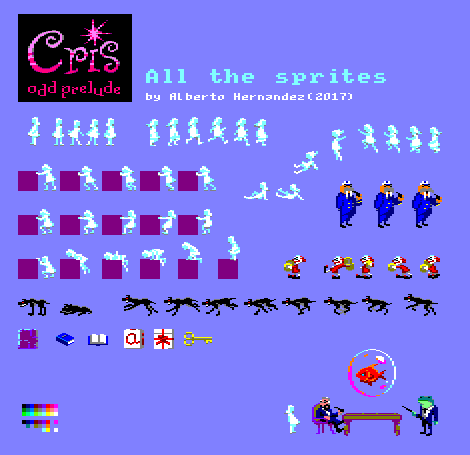 I really love this spritesheet! We are looking forward to continue working on the game and making something great. Have you considered making the disc version an "extended version" that could take full advantage of 128K of RAM? There looks to have been a high level of skill involved in all the games this year! really impressive work! Am I right in thinking purple = students, green = open? 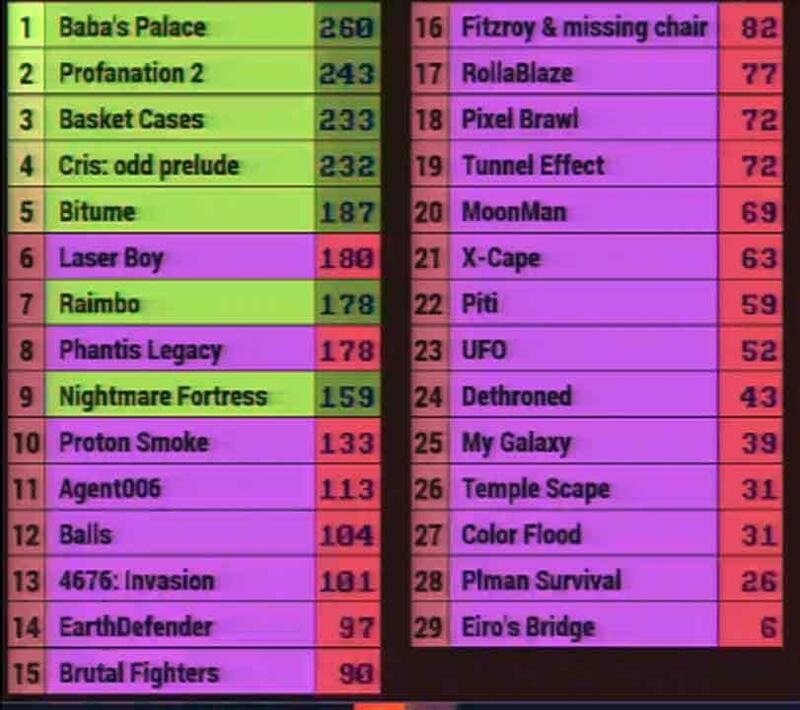 I assume that green means they got an award and purple is everyone else. Good thought. I only ask because I am interested in which games were made by @ronaldo s students. Just to see their progress and the improvement of the tools that they now have access to. Yes, @awergh is right. Green means got an Award. Top-5 are PRO Category Awards, and the next 2 are Best Student Game Awards. Laser Boy is from Carlos Sevila, which was student >3 years ago and has participated again 2 times since. And Phantis Legacy is from CPC-Power. That's the reason why Raimbo and Nightmare Fortress won Best Student Game Awards. Rest of the games are from my students except Fitzroy, which is @awergh's and Color Flood, which is from @cpcitor. So 10 to 19 games, or close to 1/3 free entries, 2/3 student entries this year.